It is our pleasure to invite you to our pension Dahlia Inn, a small boutique hotel with a modern design, which is located in the heart of Prague's city center. Our intimate, unique design hotel, newly remodeled in 2008, offers the services and cheap rates of a large hotel while maintaining the peacefulness and privacy of smaller boutique pension. Our family run design hotel includes eight spacious rooms that have been designed to be sleek and modern yet comfortable and inviting. It is truly a jewel of Prague, as a boutique pension that caters to even the thriftiest of budgets while maintaining class and elegance. Design hotel Dahlia Inn in Prague, is a family business with a small, dedicated team, enabling us to cater to our guests on a personal level. 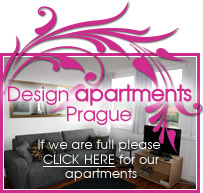 We are happy to provide assistance with excursions, entertainment, shopping, and dining in and around Prague. Modern design and comfortable rooms of our cheap pension are ideal for business or pleasure. The whole of Prague is at your fingertips at the modern design hotel Dahlia Inn. Our design hotel will feel like a second home, the minute you walk through our door in to the lobby and rest underneath the fluffy white comforters that cover the king sized beds. Most of all, our cheap pension boasts the friendliest and most accommodating staff in Prague, eager to help you get the most of your stay. If you desire a personal touch in an elegant setting with easy accessibility to Prague's most noteworthy historical and modern attractions, book your reservation with Dahlia Inn design hotel today. If you prefer more privacy, you should definitely check out our new World apartments.